Red Kite Cottage (Bwthyn Barcud Coch) Self-cateringRed Kite Cottage is a stone property providing 2 twin and 1 superking bedroom which has an ensuite plus a family shower room. All towels and linen are supplied and the cottage is comprehensively fitted with crockery, glass and cutlery to ensure an easy catering time. 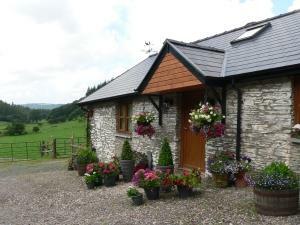 The cottage has its own enclosed garden and provides a private outdoor area to enjoy the beautiful valley views. There is easy access to the surrounding area and the sea is 8 miles away. Red Kite Cottage (Bwthyn Barcud Coch) offers weekly bookings starting on Saturday and short breaks of 3 days starting on any day in some seasons. Thank you for raising the concerns you had whilst staying at Red Kite Cottage.The cottage was cleaned on Saturday 25th August as it was a changeover day and so the problems you encountered are a mystery but will be investigated thoroughly.The lawns are mown on a weekly basis but there are areas outside the Cottage garden curtilage that are left unmanicured for the local wildlife.The lawns have,however, suffered from the hot weather during the summer months and may not have looked as verdant as usual.As the kitchen cannot accommodate the Freezer it is in the carport area which due to it's partial exposure to the elements does suffer from the external cabinet being affected.The area is not enclosed as it provides a drying area for washing, wet clothing, muddy boots and wellingtons,bike storage as well as an area for those of our guest who smoke.We were present at the property and had you notified us we would have attended to your concerns immediately.We apologise for any discomfort that you may have encountered but we strive to reach and maintain high standards at all times regardless of the situation.